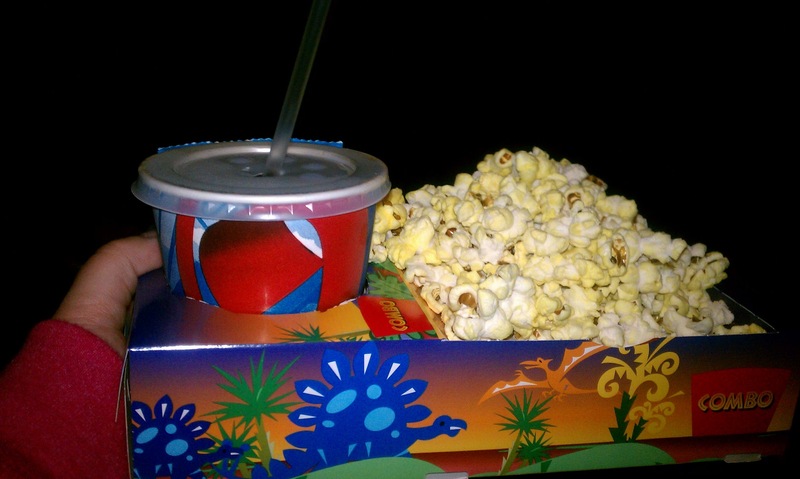 When I go to the movies I like to get the popcorn and soda. Sometimes I get a hot dog and soda. Sometimes I get popcorn, soda and candy. And sometimes I get a hot dog, popcorn and soda. I know. It’s wicked expensive. What can I say, I have expensive tastes. Sure, I could smuggle in a can or bottle of soda, but frankly, I prefer fountain Coke. I have smuggled in popcorn before, but I don’t like to. I felt guilty. And they frown on big bags or backpacks nowadays, making dishonest snack smuggling harder. Today I was not too hungry, so I got a kid pack. [Pictured above.] It has just enough popcorn and you can get either M&M’s or Gummy Bears. I usually get the M&M’s, but have had so much chocolate lately I got the Gummy bears today. The soda size is smaller than I like, but since it is a kid pack, I suppose it’s just the right size. Funny though, they only have one kind of straw. So the straw I used is GINORMUS – 3 times the size of the cup itself! I saw Arthur Christmas: Totes recommend! Very funny, appropriate for all ages. *Video also posted in honor of my biggest blog fan Tracey, who requested “More Bieber” on my website. This post is for you, Tracey! What do you think? Do you like Justin Bieber?